Slowing home price appreciation and improving inventory combined to boost California’s housing market in February as existing home sales and median home prices increased from both the previous month and year, the California Association of Realtors® (C.A.R.) said recently. Closed escrow sales of existing, single­family detached homes in California totaled a seasonally adjusted annualized rate of 368,160 units in February, according to information collected by C.A.R. from more than 90 local REALTOR® associations and MLSs statewide. Sales in February were up 4.7 percent from a revised 351,480 in January and up 2.4 percent from a revised 359,600 in February 2014. The year­over­year increase was the largest observed since December 2012. The statewide sales figure represents what would be the total number of homes sold during 2015 if sales maintained the February pace throughout the year. 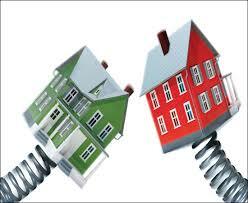 It is adjusted to account for seasonal factors that typically influence home sales. The median price of an existing, single­family detached California home was essentially flat from January’s median price, inching up from $426,660 in January to $428,970 in February. February’s median price was 5.5 percent higher than the revised $406,460 recorded in February 2014. While the statewide median home price is higher than a year ago, the rate of increase has narrowed significantly since early 2014. The median sales price is the point at which half of homes sold for more and half sold for less; it is influenced by the types of homes selling as well as a general change in values. The available supply of existing, single­family detached homes for sale statewide in February was unchanged from the 5 months reported in January. The index was 4.7 months in February 2014. The index indicates the number of months needed to sell the supply of homes on the market at the current sales rate. A six­ to seven­month supply is considered typical in a normal market. The median number of days it took to sell a single­family home shortened in February, down from a 52.4 days in January to 47 days in February but up from 40.1 days in February 2014. According to C.A.R.’s newest housing market indicator measuring sales­to­list price ratio, properties are again generally selling below the list price, except in the San Francisco Bay Area, where a lack of homes for sale is keeping sales prices in line with original asking prices. The statewide measure suggests that homes are selling at a median of 97.7 percent of the list price, down slightly from a ratio of 98.2 percent at the same time last year. The Bay Area is the only region where homes are selling above original list prices due to constrained supply with a ratio of 104.2 percent. The average California price per square foot for an existing single­family home was $210 in California Housing Bounces Back in February 2015, an increase of 2.5 percent from the previous month and a 4.1 percent increase from February 2014. Price per square foot at the state level has been showing an upward trend since early 2012, and has been rising on a year­over­year basis for 37 consecutive months. In recent months, however, the growth rate in price per square foot has slowed down significantly as home prices leveled off. San Francisco County had the highest price per square foot in February at $754/sq. ft., followed by San Mateo ($689/sq. ft.), and Santa Clara ($552/sq. ft.). The three counties with the lowest price per square foot in February were Siskiyou ($102/sq. ft.), Tehama ($107/sq. ft.), and Madera ($110/sq. ft.). Mortgage rates edged up in February, with the 30­year, fixed­mortgage interest rate averaging 3.71 percent, up from 3.67 percent in January but down from 4.3 percent in February 2014, according to Freddie Mac. Adjustable­mortgage interest rates also rose in February, averaging 2.43 percent, up from 2.38 percent in January but down from 2.54 percent in February 2014.